As summer loosens its hold and autumn looms ever closer, many nervous gardeners may be wondering: ‘Will my fruiting vegetables ripen in time?’ This is a reasonable question to ask as the weather takes an inevitable turn for the worse. Warmth loving crops can stall at lower temperatures, spluttering to a halt before they’ve crossed the finishing line. Tomatoes, for example, need a minimum temperature of 10°C (50°F) to fully develop. If temperatures remain below this for much of the day, chances are the fruits will simply fail to ripen. Another complication is wind, which here in the British Isles becomes increasingly present as the growing season draws to a conclusion. This matters, because many fruits, including peppers and tomatoes, emit ethylene to promote ripening. This odourless, tasteless gas is the vital catalyst that turns under-ripe green fruit to red, yellow and many a colour in between. If it’s too windy, much of the gas simply blows away, slamming the brakes on the ripening process. Here, then, are a few ideas to speed up ripening of some common fruiting plants. Towards the end of the season the race is on to bring home the final fruits before cool weather closes the window of opportunity. The easiest way to coax those final fruits to ripen is to make life more stressful for your plants. This may seem like bizarre advice, but by making a plant work harder it will concentrate more of its efforts on fruit production and ripening. Reducing the amount of water you give plants is the best way to ‘stress out’ plants. This is easy to do if you are gardening in a drier climate or under cover, but in wetter conditions one option is to sever some of the roots to slow the flow of water to the plant. To do this, plunge a spade into the ground about 25cm (10in) away from the central stem. Repeat, cutting out a semicircle around the plant. Alternatively, assuming your back’s up to it and you’re feeling strong, you could yank at the central stem to tear some (but not all!) of the roots – just enough to reduce the volume of moisture reaching the plant and to create artificially dry conditions. Once consistently cooler weather arrives it’s time to bring all of the fruits indoors, whether they’re ready or not. There are some reliable methods to ripen green tomatoes at the end of the season. 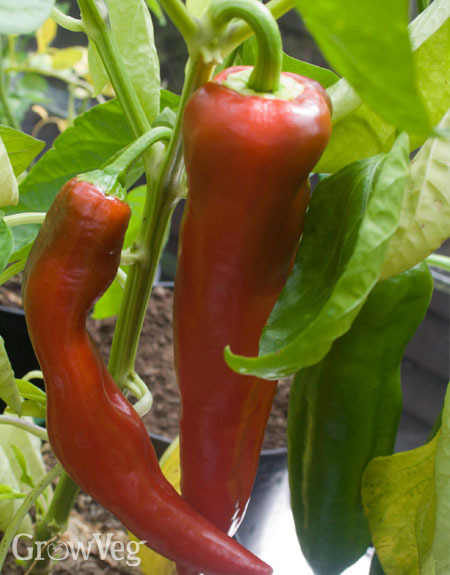 Peppers – both sweet/bell and chilli – can be exceptionally prodigious once they get into their stride. Like many flowering plants, the most effective way to speed up ripening is to simply remove ripe fruits as they appear. Some plants produce many tens of fruits over the growing season, so keeping on top of fruit removal may prove to be a daily task. By removing ready-to-eat fruits, you’ll divert all of the plant’s energies into those that remain. Fellow blogger Barbara Pleasant recommends gathering the first fruits of the season before they are mature, at the ‘breaker’ stage when they show the very first hint of colour. The peppers can then colour up indoors, in the warmth, leaving the remainder to develop further. If the variety you’re growing is heavy cropping, you could continue picking early on in order to maintain a balance between ready-to-eat peppers and those that are lined up and earmarked for consumption over the coming days. Just keep picking and the others will surely follow! Winter squashes and pumpkins naturally colour up as they mature towards the end of the growing season. Ripening will always be more effective when the fruits are left on the plant. You can hasten ripening by removing the leaves from immediately around the fruits to minimise the amount of shade cast so that the fruits can remain sun-kissed and work on their tan. You will need to protect plants should a frost threaten while there is still some of the growing season left to run. Temporarily secure plastic sheeting over the sprawling plants. Secure it at the sides with rocks or bricks. Remove the cover during the day or leave it in place if it is forecast to remain cold. Squashes need to be cured before storing, a simple process that will keep your ripe fruits in good condition throughout the winter. Most tree fruits will naturally ripen up on the tree. However, it’s worth noting a couple of simple techniques for softening up the sometimes rock-hard offerings sold at the grocery store. Simply pop the fruit(s) into a paper bag then loosely close it at the top. The bag will trap any ethylene gas produced by the fruit, encouraging it to ripen to perfection. You can even add an apple or banana (two generous ethylene producers) to the bag to speed ripening still further. Rice also traps ethylene, a fact that hasn’t gone unnoticed by many Indian households who sink the fruits into containers of rice. Delicate fruits such as peaches or nectarines need very careful handing to avoid bruising. Simply lay these soft-skinned beauties, stem-side down and not touching, between two layers of breathable linen. Within a few days their unmistakable fragrance will serve as your cue to tuck in and enjoy! Naturally these suggestions are just the tip of the iceberg. I’m very keen to hear how you speed ripening along at the end of the season. What tricks do you use? Please share them in the comments section below. "Great to know. Especially about the watering less to get tomatoes to ripen faster. I'd been thinking the opposite. Nice to understand more about the peppers as well regarding ethylene. I volunteer in a food share garden. The first year the first plantings were done by the time I found out about the garden. The third year we had a new double box to fill with veggies. The man who planted that box planted various kinds of peppers very spaced thinking they'd do better with more soil and space per plant. I thought hmm I noticed the ones that were packed tightly together in with other plants in past 2 years were the peppers that did best when harvesting came but lets see how they do this way. Turned out doing less well so I brought it up and planted alot of fast growing crops all around the peppers. I told him they don't like the wind or exposure. They have been doing much better since, and he also noticed that the crops I planted around them are doing much better because they are having to grow higher and larger to compete with peppers for sunlight. However I didn't know that the ethlene gets swept away with the wind. Cool and it will help with our fall temps and ripening now too. thanks. " "Hi Liza. Really pleased you found the article useful. I think in most cases the wind won't have a big impact on ethylene. It's perhaps more effective in places with sustained winds. It sounds like you've found a winning formula for your peppers. I've always given mine a reasonable amount of space, so I will try your technique next time round." "I believe it was Ed Hume in Seattle who said cutting the leaves off a tomato plant to let the sun in is like removing the lungs and heart of a mother so the baby can thrive, i.e. the benefits of the sun work thru leaves. Do the squash work differently?" "Len RoperI think the idea is to remove the immediate leaves to a given fruit after it has set--reached near max size. At that point it is no longer taking up significant sugars or anything else, and the leaves will not be providing much of anything to it. The greater good is served by direct sunlight to the fruit itself.Remember, a green tomato or other vegetable has chlorophyll in and of itself and can make its own sugar."